The 80 hours learning material provides insights on smart grid technology and reflects the technical regulation in Germany. The course is available in German language at the beginning. Every existing instructor on NetSpace has immediate access to the new course material. Instructor training is not mandatory. Why do we need an intelligent grid system? We are experiencing a transition in energy supply all over the globe. Renewable energy sources produce more and more of the electrical energy demand in many countries. When we use solar and wind energy, energy providers face a significant challenge: Fluctuating energy production with changing weather conditions. Intelligence in the grid system can help to balance the ups and downs in energy production and consumption. What will be installed in many countries over the next decade is known as a smart grid. The smart grid system is a huge IT implementation program. While traditional meters were read out once a year, modern digital meters provide data every 5 minutes, every day, 12 months a year. Data about the actual household consumption and information about the grid situation has to be exchanged over an IP based network. Traditional vocational education for electrical installers does not include competences to connect intelligent devices with the internet. But this is the qualification that millions of electrical installers all over the world will need in the next year. Cisco and its partner BFE Oldenburg from Germany developed a course material that will help to close the skills gap in electrical engineering. We are convinced that this will support individual employability and will help to roll our an intelligent grid infrastructure. 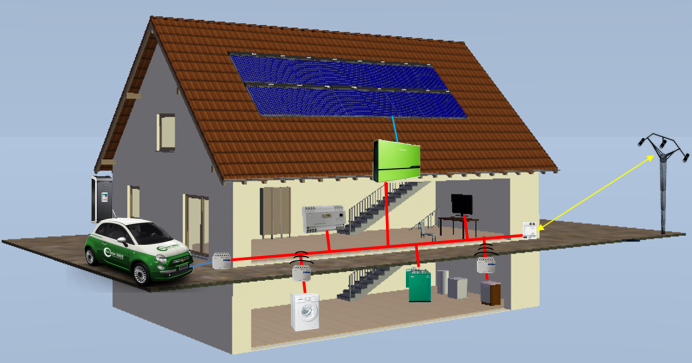 The 80 hours course explains the functionality and required devices of a smart grid home system. Students will learn how to connect smart meters with a home area network (HAN) and integrating smart meter gateways in a wide area network (WAN). Instructors can expect detailed installation procedures for smart meter installation and security aspects of a smart grid system based on German technical regulations.